Since the Global Financial Crisis, various media outlets and pundits have been diagnosing neoliberalism as the source everything that is wrong with the world today and predicting its imminent collapse. Implicit in these pronouncements is an assumption that we have come to grips with what neoliberalism is and how we are to combat it. But on closer inspection, definitions of neoliberalism have differed according to a range of intellectual and political frameworks. The case of the influential French theorist Michel Foucault is a case in point. Foucault illustrated in his Collège de France lectures of the late 1970s how complicated it is to grasp what neoliberalism is, and problematised the reduction of it to mean either the free-market ideology of capitalism or even an anti-democratic movement – all such diagnostics, for him, ‘mean[ing] nothing at all’ (cited at 147). Drawing his sources from the likes of Frederich Hayek, German Ordo-liberalism, and Chicago neoclassical school of economics, Foucault’s influential reading of neoliberalism is to picture it as ‘really something else’: that is, in its singularity, as a model of ‘governmentality’ that is embodied in a ‘way of doing things’. In 1979, Foucault (2008, 18, 22) diagnoses neoliberalism as a discursive claim ‘regime of truth’ marking ‘the problem of our times’. 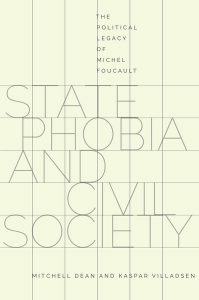 In State Phobia and Civil Society: The Political Legacy of Michel Foucault, Mitchell Dean and Kaspar Villadsen discuss Foucault’s interpretation of neoliberalism modelled on the themes of governmentality and biopolitics as being both influential but also problematic in relation to a variant of anti-statism. In part, this book arrives at an interesting moment in Foucauldian studies where new questions are being raised over Foucault’s lectures on biopolitics. In particular, this book comes after the controversial publication of Daniel Zamora and Michael C. Behrent edited volume, Foucault and Neoliberalism (2014), which incidentally, features a contribution by Dean. Zamora and Behrent’s book posed a more direct critique of Foucault’s account of neoliberalism as too sympathetic by way of a close study of the historical context behind these lectures and Foucault’s own political actions and alliances amongst the ‘Second Left’ in post-Gauchist France of the late 1970s. However, it was not them alone that have raised this association, as Foucault’s auditor and general editor of the College de France Lecture series, François Ewald, described in a 2012 seminar that Foucault’s course on The Birth of Biopolitics and general direction of thought thereafter was an ‘apologia of neoliberalism’ (cited at 145-6). These allegations of neoliberal sympathies in Foucault’s work have provoked a wave of reaction by theorists located within the more mainstream Foucauldian studies field, with the likes of Antonio Negri even denigrating Ewald as a ‘Right-Foucauldian’ (cited at 151). Knowing Foucault’s evasion of political labels and his experimental style of lecturing which preclude deducing his actual political position from his subject matter – Dean and Villadsen pose instead, what kind of politics should we draw from his genealogical mode of analysis of governmentality, especially, vis-à-vis the state? In order to frame the problem of Foucault and his relation to neoliberalism, Dean and Villadsen choose firstly to read him in his historical-intellectual context. They do this by focussing in on the sequence of Foucault’s College de France lectures running from 1975-79 as ‘key to his political perspective and its development’ (3) and that these lectures are bound in much part by the context of Foucault addressing particular interlocutors situated within the ‘crisis of Marxism’ and institutional socialism in 1970s France (12-3). Whilst these authors note Foucault ‘escapes the Siren song of civil society’ (3) and is able to identify the ‘state-phobia’ of both neoliberalism and the ultra-left that converge in their view of the state as a repressive even ‘fascist’ force, the chapter poses ‘there remains a question whether Foucault escaped the antistatism he identified.’ (13-8). To demonstrate the thin line between Foucault’s mode of addressing neoliberalism and the post-Foucauldian critique of it over the last few decades, the authors discuss Michael Hardt and Antoni Negri’s theory of the ‘multitude’, Nikolas Rose’s affirmation of the vitalism of natural sciences as a model for a communitarian model of ethico-politics, and the championing of ‘subjugated knowledges’ in queer, gender, post-colonial studies (chs. 2-4). Instead of adopting Foucault’s reserve on the topic in question, these various readings and uses of Foucault share a more pronounced normative anti-statism or ‘value-orientation’ that goes beyond the context of Foucault’s analysis due to the changing geo-political context of globalisation and the hegemony of neoliberalism since the fall of the Berlin Wall. The first part of the book is then clear enough in its critique of a particular strand of Foucault’s influence amongst the post-Marxist Left. Dean and Villadsen argue that in spite of their desire to be free from the state/civil society binary, Hardt and Negri, as well as Rose, end up with a transformed conceptualisation of ‘civil society on steroids’ that deepens further the kind of ‘state phobia’ Foucault himself warned against (44). This point draws much from the influence of Deleuze on post-Foucauldian politics, especially given Dean and Villadsen repeatedly adopt Deleuze’s (2006) reading of Foucault as a ‘vitalist’. In the second part of the book (chs. 5-10) the authors venture towards a more original reading of Foucault’s theoretical perspectives on civil society in order to get to the question of his state theory. In Chapter 5 (‘Blood Dried Codes’), the authors discuss the 1975-76 lecture series, Society Must Be Defended, to demonstrate how Foucault’s closest approximation of a theory of the state was by framing it as a site of hegemonic power formed out of ‘race wars’, whereby one ‘race’s’ juridical norms are another’s form of oppression. As noted by Dean and Villadsen, the pivotal turn in Foucault’s thinking in this series is how he concedes to the nominalist claims of political historicism on the question of the state based on the ‘counter-history’ writings of the military strategist Carl von Clausewitz and historian Henri de Boulainvilliers. These writers as Foucault reads them, understood the state not as a ‘universal’ or idealistic entity, but as ‘the outcome of contingent struggles and impossible totalizations’ amongst ‘warring factions’. Although, the French Revolution for Foucault fused together the idea of a nation or ‘the people’ with the state to the end the ‘race wars’, it also, marked the birth of biopolitics as an ‘internal war’ based on the security of life and ‘permanent purification’ that would open the door for the ‘police state(s) of fascism and communism (75-83). As the authors show, Foucault began to transition in his analysis hereon from a war-model of politics to biopolitics by switching the focus from the discipline of bodies to multiple dispositifs of security and management of the life of populations – marked out by his next lecture series, Security, Territory, Population (1977-78). The second aspect the authors discuss of Foucault’s account of civil society is more firmly sourced from The Birth of Biopolitics. For instance, in Chapter 8 (‘When Society Prevails’), Dean and Villadsen return to the question of where civil society fits into this revised discussion of power and the state by way of Foucault’s reading of 18th century philosopher, Adam Ferguson. Foucault analyses civil society as a historically innovative idea that was invented so as to respond to the problem of firstly how to make government rationality immanent, and on how to unify the juridical subject with the economic subject so as to individuate more governable or entrepreneurial subjects that can help facilitate economic competition as a ‘regime of truth’. In Chapter 9 (‘Political and Economic Theology’), the authors present the Foucault’s analysis of the virtualised character of civil society in terms of secularisation so as to reveal how his genealogy is ‘incomplete’, because it misses secularised even eschatological nature of civil society’s movement against the state. It is in Chapter 10 (‘Foucault’s Apologia’) where we get to the crux of what this book is asking. It provides a kind of indirect response to Zamora and Behrent’s polemic by acknowledging the significance of Françoise Ewald’s interpretation of Foucault’s neoliberalism as a ‘question that must be posed’ (145). The dialogue between Ewald and Becker mediated by Bernard Harcourt at 2012 seminar at the University of Chicago provides the focus of this chapter. The authors do not dismiss Ewald’s description of Foucault as offering an ‘apologia of neoliberalism’ for it does not mean simply an endorsement ‘for’ it. The difference being as Ewald explains it with respect to Becker’s theories of ‘human capital’, neoliberalism is an anti-humanist discourse of ‘nonmoral truth-telling’ and Foucault was interested in its ‘epistemology’ as opposed to its ideological ‘convictions’ and denunciating it. As the authors note, this may be why Becker himself could not see any real critique of his work to be derived from Foucault’s lectures. Hence, why Dean and Villadsen tend to identify the only real critical point of Foucault’s lectures on neoliberalism is located towards the end when he discusses Becker’s model of environmental intervention into markets could manipulate and manage behaviour in a ‘coercive’ way (159-60). Much of this book should be commended for providing a more sophisticated and critical intellectual-historical contextual reading of Foucault’s lectures at the College and posing challenging questions over the endgame of the Foucauldian analytics of governmentality. However, Dean and Villadsen may still be overplaying Foucault’s’ supposedly ‘liberal’ moment as Zamora and Behrent do also. Given Foucault’s assessment in The Birth of Biopolitics lectures that there was no ‘autonomous socialist governmentality’ during his time (cited at 14), would suggest he saw a serious challenge for any Leftist politics to ‘create one’ before it was too late. The question of Foucault’s ‘ethical turn’ in the last of the College lectures also is not discussed in any depth in this book. The significance of the late period of Foucault’s work on the genealogy of the subject is that it also appears to deal with similar difficulties he faced with the problems of neoliberal governmentality by seeking to uncover ‘counter-conducts’ that could possibly combat it. Furthermore, if Foucault falls short in the task of recovering the state because he cannot separate it from the heterogenous regimes of governmentality and disciplinary power and normalisation, we are then confronted by the question of how could the state be restored as a normative site for critiquing the intrusion of neoliberal regimes beyond presupposing it can. Despite some of the richness of Foucault’s lectures on neoliberalism and biopolitics, these authors have nevertheless quite rightfully posed important questions and argued the real stakes here are over his political legacy, and ironically, squared in on the costs of this kind of genealogical analysis if it is all we have to utilise in the face of a rampant globalised variant of neoliberalism. This is an invigorating enough question for further debate given new historical circumstances may require us to turn Foucault on his head, whilst taking on board his critique of civil society and state-phobia. Although it is no news that Foucault’s work problematises the use of normative or anthropological criteria in critical theory and political philosophy, this book also challenges us to think whether a generalised genealogy of governmentality ends up any better position to map our historical present. The ‘problem of our times’ may require us to be prepared to move beyond Foucault’s experimental method in some way, even if we need to acknowledge him as a significant and unique point of departure in the critique of neoliberalism. Deleuze, Gilles 2006 Foucault Trans. Sean Hand (London: Continuum). Foucault, Michel 2008 The Birth of Biopolitics: Lectures at College de France 1978-79, ed. Michel Sennelart and trans. Graham Burchell (Hampshire and New York: Palgrave McMillan).